G10-FR4 (FR4) is a fire rated electrical-grade, dielectric fiberglass laminate epoxy resin system combined with a glass fabric substrate. The abbreviation "FR4" means:� F (for flame) and R (for retardancies) and the 4 is a # 4 epoxy. FR4 grades offer excellent chemical resistance, flame ratings (UL94-VO) and electrical properties under dry and humid conditions.��FR4 also features high flexural, impact, superior mechanical strength and bond strength at temperatures up to 130�C. G10-FR4 is suitable for structural, electronic, pc boards and electrical applications. 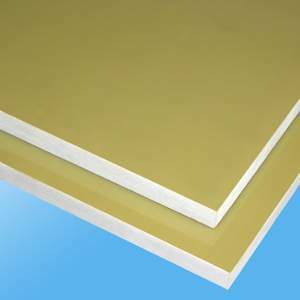 FR-4 is a versatile material due to several mechanical and electrical properties; it is less reactive at high frequencies, absorbs less moisture, has greater strength and stiffness, and is highly flame resistant.� G10/FR4 material conforms to the requirements of military specification Mil P 13949 Type F and and is rated UL 94V-0.� A few other applications:� Communications, Computer, Computer Peripherals, Instrumentation, Industrial Control Systems and OEM Electronics. G-11 material is used in applications where a good dielectric strength is needed plus the added value of the Fire retardency.� Used in Power Plants, Buss Bars, Electrical generation units.� G11 is available in sheets.� MAX OPERATING TEMPERATURE 345� F.